TBILISI, DFWatch–Three months after a landslide disaster in a Georgian valley near the Russian border, another landslide struck Thursday, severing the only road across the Caucasus mountain range and cutting gas supply to Armenia. Two people are missing. The road through Dariali Valley is temporarily closed for traffic. According to locals, the two missing are workers at the construction site of the Dariali hydro power plant near Devdoraki Glacier. One of them is thought to be a Turkish citizen. The border crossing on the Georgian side of the border is flooded, while on the Russian side, a few hundred meters away, Russian authorities report of a massive traffic jam of light vehicles and trucks waiting to go to Georgia, Armenia or Azerbaijan. The road is the only one that connects Georgia and Armenia with Russia. A traffic jam has also been building up on the Georgian side, at the village Bodorna, about 120 km from the Russian border. 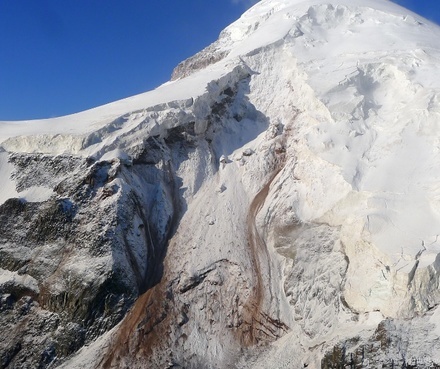 The Georgian government said that as in May, the landslide was caused by Devdoraki glacier. 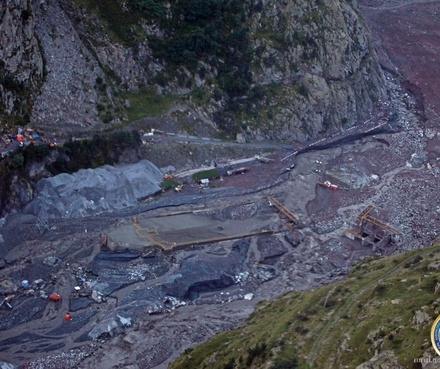 It said the current landslide caused more material damage than the previous one. The landslide was triggered by heavy rain through Wednesday night and Thursday morning, according to the government. Environmentalists have earlier said a hydro power development along the river Tergi might change the water flow and increase the risk of landslides in the already high risk area. The government in 2011 gave permission to construct three hydro power stations, Larsi, Dariali and Kazbegi, all on the river Tergi and one of its tributaries, under the ownership of the same company. The Larsi plant is finished, while the two others are under construction. The Ministry of Regional Development and Infrastructure (MRDI) in a statement on Thursday tried to calm fears that the landslide will block the river Tergi. This was what happened in May’s disaster, and led to the creation of an artificial lake. If it happens again, there is a risk that the water might burst through and flood settlements downstream along the Tergi river, most importantly Vladikavkaz on the Russian side of the border. According to MRDI, water flow in the valley is still following a canal which was made during the cleanup after the landslide in May. The new landslide has also damaged a pipeline that supplies Armenia with Russian natural gas. Georgia has informed Gazprom Armenia, the local Armenian supplier, that at about midnight, the pipeline was hit by a landslide which caused damage that severed the gas flow. The Georgian government says it has mobilised all its resources to handle problems caused by the landslide. The formal name of the road which is now blocked is Mtskheta-Stepantsminda-Larsi Highway. It used to be called the Russian Military Road, and connects Georgia and Armenia to Russia’s North Caucasus republics.